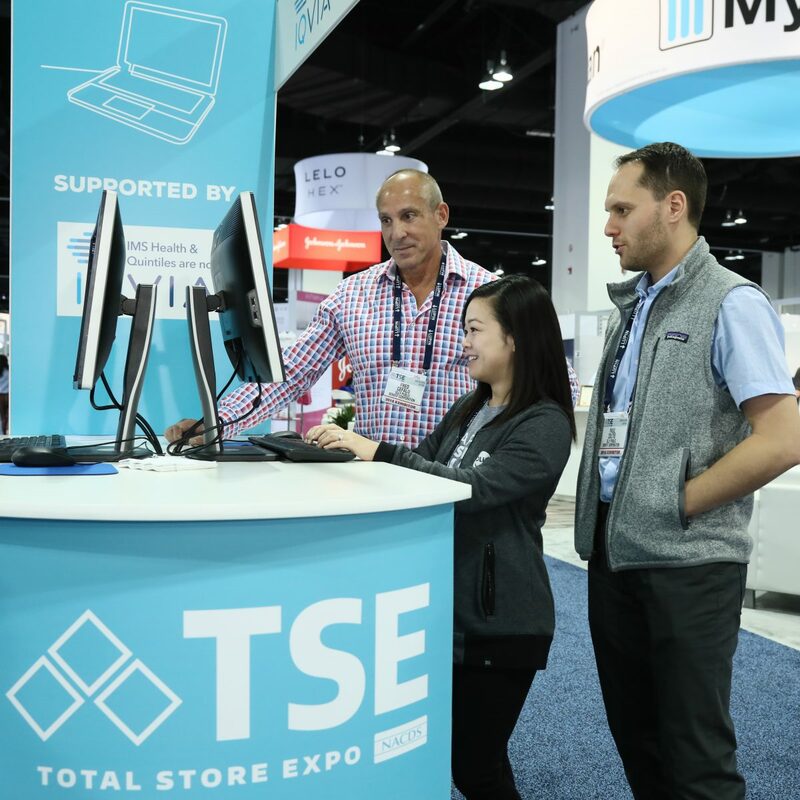 Sponsorship of the NACDS Total Store Expo provides organizations the ability to enhance their image with senior level executives from the drug, food and mass channels. Affiliate your company with the NACDS Total Store Expo and demonstrate your support of the industry. 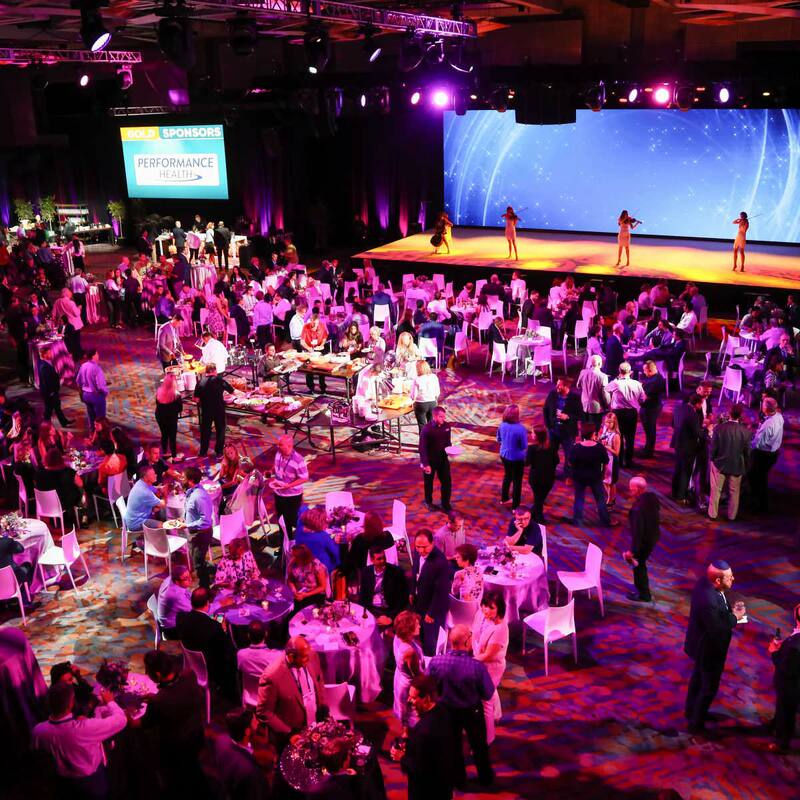 The Extravaganza is the final evening of the Total Store Expo, including a variety of cuisine and exciting entertainment. Leave a lasting impression with attendees at this grand celebration filled with music, food, and fun. Sponsor benefits include signage at the main entrance, signage at each bar with corporate recognition, napkins with corporate logo, and your logo on our “Thanks To Our Sponsors” signage and conference website. Sponsor aisle banners at the NACDS Total Store Expo and have your company logo present throughout the Exhibit Hall. Your company logo will be prominently displayed on each aisle banner under the aisle numbers. Exhibit Hall Cyber Stations consist of computer terminals with printers placed in the highest traffic area of the NACDS Total Store Expo. The sponsor will receive recognition on the screen saver and signage at each station. NACDS provides all programming and equipment, the sponsor just has to show up and enjoy the show. Capabilities will include internet connections and email access. The Exhibit Hall Floor can be easily navigated by all attendees who utilize the Exhibit Hall Locator Card. This valuable tool helps attendees locate booths for their next appointments. By sponsoring this exclusive high profile appointment tool, your company will be recognized every time an attendee opens the map, saving valuable time between important appointments. Sponsor the NACDS Total Store Expo hotel key cards for attendees staying at the hotel and communicate your company message each time the attendees enter their hotel room. Logo and message are printed on each of the room keys. The sponsor has the option of designing the key within hotel specifications. Welcome attendees to their first full day at the show by sponsoring the NACDS Total Store Expo (TSE) Reception celebration, filled with music, food and fun. The NACDS TSE Reception is organized by NACDS and includes open bars and heavy hors d’oeuvres. Sponsor benefits include signage at the main entrance, signage at each bar with corporate recognition, napkins with corporate logo, and your logo on our “Thanks To Our Sponsors” signage and conference website. This exclusive sponsorship is a time-saver and final nighttime reminder of the next day’s activities. At the conclusion of each business day, an email will be sent to all attendees with the next day’s schedule of events. By sponsoring this high-profile opportunity, your company will be recognized each time an attendee utilizes the Daily Schedule of Events Email to assist them throughout their busy day ahead. Sponsor will receive exclusive recognition by sponsoring the Exhibit Hall lunches on Sunday and Monday for attendees. Sponsor benefits will include signage at the luncheon entrance and an opportunity to leave literature at each table. Sponsor the NACDS Total Store Expo Mobile App and provide your organization the opportunity for maximum exposure. By sponsoring this high-profile technology, your company will be recognized each time an attendee utilizes the Mobile App to get the latest conference updates to the Schedule, Participating Companies, Exhibitor Floor Plan and more. Sponsor will receive exclusive recognition by providing coffee and beverages to attendees during the exhibit hall refreshment breaks; and networking and continental breakfast prior to the Business Program and Insight Sessions. Sponsor receives napkins with their logo, signage on the break tables, and an opportunity to leave literature at the station. This handy little pocket guide is a quick reference to the daily activities taking place at the NACDS Total Store Expo. NACDS will prominently place the Pocket Guide behind the name badge of all attendees. Sponsor will have their logo strategically placed for maximum brand building and recognition. Sponsors can place a one-page flyer in the registration materials distributed to all conference attendees. This is ideal to highlight your booth location, invite attendees to your cocktail party, or supply all attendees with your product brochure. Inserts must be 8 1/2″ x 11″ size or smaller, NACDS needs to approve the insert prior to June 21, 2019, and have in hand by July 26, 2019. Additional fees will apply for late arrivals. Welcome attendees to the NACDS Total Store Expo during the kick-off Welcome Reception celebration filled with music, food and fun. The Welcome Reception is organized by NACDS and includes open bars and heavy hors d’oeuvres. Sponsor benefits include signage at the main entrance, signage at each bar with corporate recognition, napkins with corporate logo, and your logo on our “Thanks To Our Sponsors” signage and conference website. In recognition of your valuable contribution to the overall conference, your company will receive an invitation for one senior executive to attend dinner with the NACDS Board of Directors during the Total Store Expo. Your company will also receive one complimentary space in the Product Showcase and the opportunity for two company representatives to be housed at the headquarter hotel. You will also be acknowledged on the Total Store Expo website and on digital signage during the show. Sponsors will be recognized on the NACDS website, during the Business Programs, and on our “Thanks to our Sponsors” digital signage. For more information, please contact Jim Whitman at (703) 837-4610 or email jwhitman@nacds.org.